What more can you ask for than Sylvester Stallone reprising his role as icon Rocky Balboa and Michael B. Jordan playing Adonis Creed the son of Apollo Creed? The chemistry these two bring to the floor is beyond words. Sylvester and Michael made the film, added a little comedy and tugged at your heart strings. Their characters need each other: Adonis wants to make a name for himself and make the name of Creed famous. Rocky is just the owner of a restaurant and doesn't want to step in the ring as a fighter or coach, but deep down he knows that is what he loves and needs because he was born to do so. Adonis never met his dad because he was not born yet when Apollo died. We see his struggle early in his life and even though he had a good job later on, deep down that was not what he wants to do with his life. Instead, he takes a leap of faith and asks Rocky to train him. When Rocky finds out that Adonis is Apollo's son, he can't let his old friend down. Although Creed is sort of the continuation of the Rocky films, it's mostly about Adonis, as the title suggests. Sure, I liked seeing Rocky again, but watching a new fighter begin his own story was a great way to continue the Rocky franchise. I have nothing negative to say about this film, it was a fight straight through and through. Rocky is old so we see him struggle and go through a phase which was sad to see but Adonis was there for him, not just as a student but as a son, as family. Other cast members did amazing, including Adonis's love interest, Bianca, played by Tessa Thompson. She also became a big part in Adonis' life and is there by his side in the end. 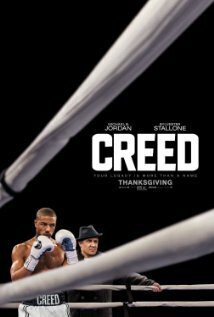 Creed is a must see and a must own when out, it is touching with a great story and a great cast. When you hear the old Rocky music playing, it sends chill throughout your body. The last fight in the movie is an all-out brawl each round. With rocky in his corner and his loved ones at home watching, can Adonis win and bring fame to the Creed name once more? The Rocky and new Creed duo was fantastic.